verse 2: You shall not add to the word that I command you, nor take from it, that you may keep the commandments of the Lord your God that I command you. If you are tied to God, you are free on earth. Luther: Hence that argument of the scholastics about free will is most foolish: ?I have the freedom to govern a cow or to throw away money; therefore I have the freedom to do what pleases God and to serve Him.? But that is the same as if you said: ?I can tread on the earth with my feet and walk on the earth; therefore I can also go into the heaven and walk on the clouds.? Indeed, from his creation man has free knowledge and power to rule and deal with those lesser than himself. But to govern himself and to do what pleases his superior, he neither knows nor is capable of. There free will ends; there he is necessarily blind, powerless, yes, dead and condemned. Devising your own worship of God, not prescribed by Him, leads you down the wrong path. Luther: It is not a valid argument to declare on behalf of the traditions of men: ?The Moabites were idolators and made sacrifices to demons; we, however, serve the true God in ceremonies devised with a pious intention and with good zeal. Therefore our efforts are not the same as theirs.? I answer: ?The Moabites and other nations did not worship demons because they knew that they were demons, but they believed that they were serving the true God no less than the idolatrous Jews, yes, than all our papists, even the holiest and most religious. But their godlessness consisted in this, that they took over the true name of the true God and worshiped Him with ceremonies not commanded by God but devised by themselves. God doesn’t want us worshipping by our own strength, but by his strength. Luther: He wants to be worshiped and regards favorably whatever people who are still godless undertake without the Word of God. But, as Ps. 5:5 says, He is not a God who will want godlessness. He is rather the God of the righteous, and He wants to be worshiped by the godly and righteous, who are justified through the Word and His grace, not through their own strength. Do not try to change who God is and what He wants based on what you want. Luther: they thought about God what seemed right to them. As though God could be shaped and changed according to the imaginations and notions of their heart, when He Himself cannot be shaped and changed! Luther: To these they give different names, and they call God now Baal, now Ashteroth, now Dagon, etc., just as we do when we call God Benedict, Francis, Dominic, and chiefly the pope; for by all these ceremonies and teachings we think we please God, an opinion which is a deceitful idol of the heart, where, in the place and name of God, Satan sits and is worshiped. We cannot worship God based on our works. Luther: Rom. 1:21 ff. : ?For although they knew God, they did not honor Him as God or give thanks to Him, but became futile in their thinking, and their senseless minds were darkened, etc.? I say they knew God, that is, they had the knowledge that there is some kind of deity. The efforts with which they worshiped idols in the place of God demonstrate this. For if they had not had a knowledge of a deity, they could not have assigned deity to idols or applied to it the name of God. But this was their folly, that they did not give glory to Him as God; that is, they imagined for themselves a god who would be worshiped by their opinions and efforts, that in this way they might glorify themselves as men who by their own powers could make something pleasing to God and deserve His favor. We wrongly want to shape God by us instead of us being shaped by God. Luther: However, this is dishonoring God and not giving thanks for things received from God; it is being proud and presumptuous concerning offerings to God. This is nothing else than to want God to be shaped by us, not ourselves to be shaped by God. It is to want to adjust the plans and thinking of God to our plans and thinking, as He says in Isaiah (40:18): ?What likeness will you set for Him?? and in Is. 55:9: ?As far as the heavens are higher than the earth, My ways are exalted above your ways.? Luther: It follows in the proper sequence. First he deals with the fear and the wrath of God, with which a lawgiver should begin. Then he joins to it the glory and the love of God, to draw the terrified ones to love. Luther: The third item stems from their superiority and worth over all nations, which follows herewith. ?For those who honor Me,? He says (1 Sam. 2:30), ?I shall honor them.? Luther: He is wise who knows the relation of faith and religion to God and the relation of law and love to one?s neighbor. Luther: He, however, has understanding who in both respects is sagacious, prudent, and cautious, so that he proceeds properly in them and is led astray by no deception ? in German: weis und klug. 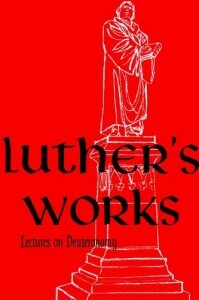 Luther: But ponder this still more, with how few words Moses rejects and condemns the entire wisdom and knowledge of men, and shows that the wisdom and understanding of the people of God does not consist of those sharp speculations of the sophists or those magnificent provisions of princes and wise men but of the knowledge and keeping of the Law of God. ?This [he says] is your wisdom and understanding.? Luther: Wisdom gained anywhere else is nothing but stupidity before God. The godless defend and protect their gods. Luther: At the same time, however, he includes and points out the cross of the people of God. Because He is near those who call upon Him, this proves that those calling are in trouble, which forces them to call, just as this nation really always was, and ?all who want to live a godly life shall endure persecutions? (2 Tim. 3:12), so that a place remains for pleading faith, and occasion is given to draw near to God. The religions of other peoples have godless statutes concerning God and unjust laws regarding one?s neighbor. Thus their gods are far away and cannot save. In fact, the gods are protected and defended by their devotees. True knowledge is knowing and keeping the law of God. Luther: At the same time, however, he includes and points out the cross of the people of God. Because He is near those who call upon Him, this proves that those calling are in trouble, which forces them to call, just as this nation really always was, and ?all who want to live a godly life shall endure persecutions? (2 Tim. 3:12), so that a place remains for pleading faith, and occasion is given to draw near to God. The religions of other peoples have godless statutes concerning God and unjust laws regarding one?s neighbor. Thus their gods are far away and cannot save. In fact, the gods are protected and defended by their devotees. verse 12: You heard the sound of words, but saw no form. Inwardly we make our own gods by having our own thoughts and opinions of god outside his voice. Luther: This passage condemns not only outward representations of God, which He wanted to be forbidden to a simple and childish people, but especially inner ones, which are (as we have said above) opinions and speculations about God constructed out of ourselves without the voice of God. verse 24: God is a devouring fire, a jealous God. Luther: This saying is quoted also in the Epistle to the Hebrews (12:29), and it is worth emphasizing, to terrify and humble the godless. However, ?consuming fire? and ?jealous God? are two distinct thoughts. Luther: He is called a fire because He devours completely and leaves nothing for the godless, and nothing can withstand His wrath. Luther: He is called jealous because His disposition is such that He does not want to spare. Who, then, would not fear Him who, as you know, does not want to spare and has implacable and unceasing power to avenge? God as fire is emphasized in the first commandment. Luther: You will note especially that God is described by Moses as a fire and a Jealous One in connection with the First Commandment, according to which He is most despised where He should have been most feared and worshiped. So you see which Commandment He Himself stresses most strongly, namely, that He is to be our God, so that we set up no confidence in works but trust in His mercy alone. I like the bluntness that Luther writes with. Luther: This expression, ?finally,? is generally used for what we call ?later.? Moses wants to describe the wrath of God in such a way that he always leaves a place for repentance by those who eventually come to their senses. Luther: Hence, in order to arouse this repentance and to condemn despair, He adds the sweetest and most faithful promise, on which also the prayer of Manasseh, King of Judah, is beautifully based: ?The Lord your God is merciful. He will not forsake or destroy you; nor will He forget the covenant He swore to your fathers.? In this way He shows at the same time what true repentance is, namely, a burning thirst for mercy in the affliction of conscience. For to them alone is sweet mercy offered, not to the hypocrites.